Trying to memorize the periodic table? Well, your job is going to get a bit harder! 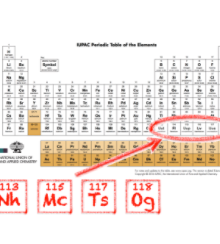 Element numbers 113, 115, 117, and 118 have officially been given names. They are Nihonium (Nh), Moscovium (Mc), Tennessine (Ts), and Oganesson (Og), respectively. Traditionally, the elements are named after the scientists who discover the elements or the place where the elements were discovered. Moscovium is named after Moscow (Russia) where some of the experiments were conducted that led to the discovery of the element. Tennessine is named after the Tennessee region (United States). Nihonium is named after a word for Japan in Japanese “Nihon”. Oganesson is named after the scientist Yuri Oganessian, whose research work helped in the element’s discovery. 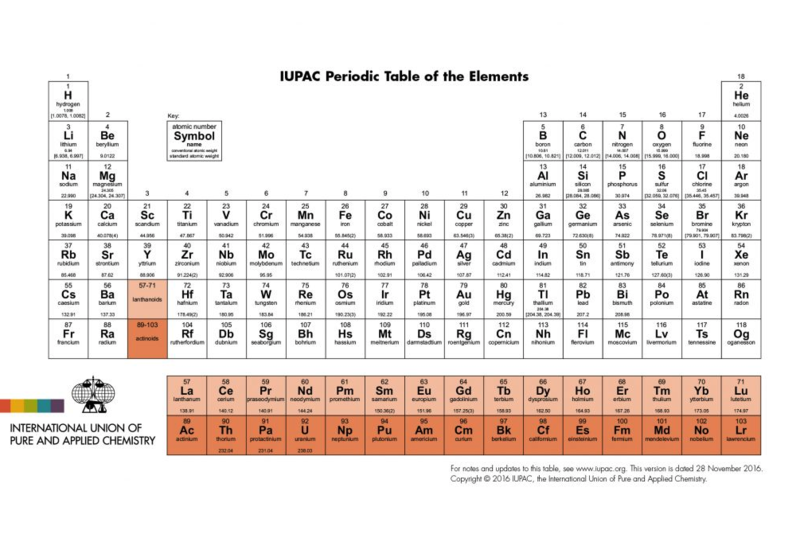 The periodic table is an organized list of chemical elements according to certain characteristics the elements have. Here are two videos. The first is a song called “The Elements”. The other is Harry Potter star Daniel Radcliffe singing The Elements.